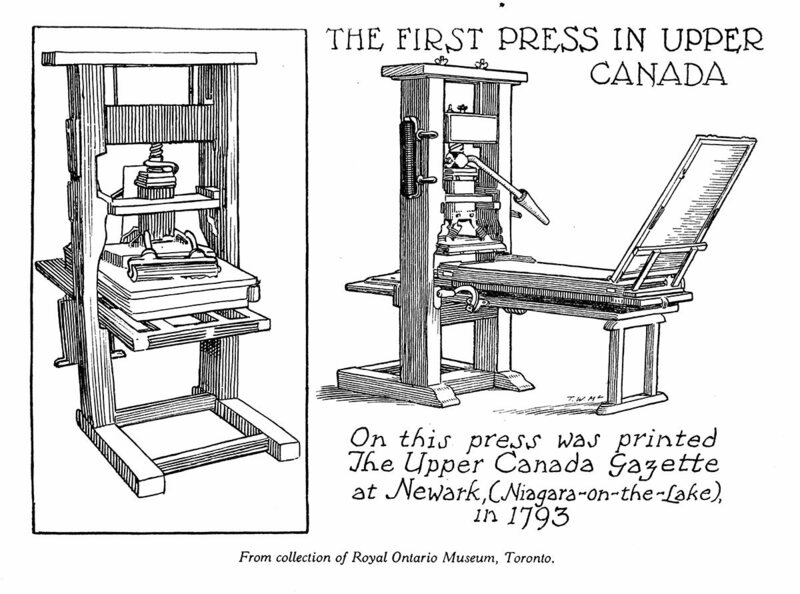 The old wooden handpress (see illustration) is believed to have been used at Newark (Niagara) by Louis Roy, first printer of Upper Canada, 1792-1794. 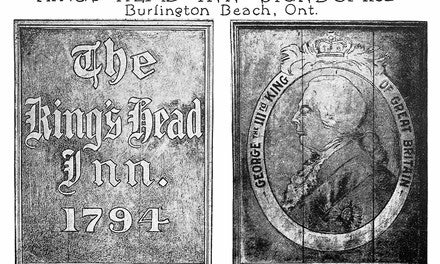 Since he was employed by the Government under Lieutenant-Governor John Graves Simcoe, he was in reality first King's Printer, though that designation seems not to have come into general use until 1798. 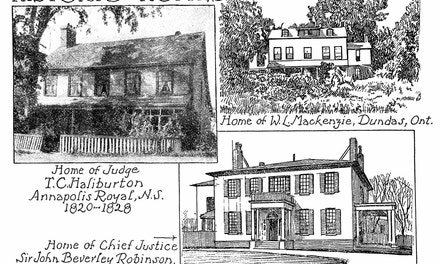 Roy's duties consisted in printing the Upper Canada Gazette or American Oracle, official mouthpiece of the Government of Upper Canada, and such notices, proclamations and stationery as the various government offices might require. The exact date when the press was set up at Newark is not known. It is known, however, that on June 12, 1793, and again on June 14th and 15th, Simcoe had sent copies of the Upper Canada Gazette to Lord Dorchester at Quebec that he might see for himself the report of Simcoe's speech to both Houses of the Legislature at Newark - the first upon opening of the second session, on May 31, 1793, and the latter upon the effort of the Legislative Assembly to preserve "water communications and boundaries by the application of the Militia to such purposes." In the same year  Roy also printed two eight-page pamphlets, Speech of His Excellency John Graves Simcoe, Esq . ... upon opening the first session of the Legislature of the said Province, and Acts of the Legislature of His Majesty's Province of Upper Canada. It is not known whether these pieces were printed at the same time or on different dates. The imprint affords no clue. A broadside, dated [Niagara] February 7, 1793, in possession of the Toronto Public Library, may have preceded both; but this is doubtful. The press began to print in the preceding January, and it is almost certain that Simcoe would have ordered impressions of his own speeches first. Mrs. Simcoe mentions the press in her diary. Hers, however, was not the first reference to the new press at Newark, then the capital of Upper Canada. There were at least two others: On August 30, 1792, William Jarvis, Provincial Secretary, writes in part to his father-in-law, the Rev. Doctor Samuel Peters of Hebron, Connecticut, then in England: "People live here [Kingston] from hand to mouth as if they were to be gone tomorrow." Then he adds, "we have no printer yet." Later, on January 15, 1793, at least three months prior to Mrs. Simcoe's entry, Mrs. Hannah Peters Jarvis, wife of the Provincial Secretary, was to write to her father "Our printer has got his press up and commenced printing but nothin published as yet. A paper is expected to be printed weekly and is most likely to begin after the 18th." What was expected to take place about three days later, took three months to the day. None the less it is clear that the first printing from the old hand press issued some time in January, 1793. Now among the exhibits of the Museum at Fort George, Niagara, the wooden press passed through the hands of successive King's Printers who all turned it to good account. In 1798 it was moved from Niagara to York (Toronto) where it survived the attack on the town by the Americans, in 1813, to remain actively in use until the eighteen-thirties when it was superseded by improved iron models, built on the same principle but neater and more compact in form. See W. Colgate : Louis Roy: First printer in Upper Canada, (Printing Review of Canada, Montreal, April, 1948: Vol. 23, No. 11); John Ross Robertson: Landmarks of Toronto (Vols. 2 and 5). Editor's comments concerning "The First Press in Upper Canada"
In later editions of The Picture Gallery of Canadian History Volume 3, it is noted that the press is "Now at Fort George, Niagara-on-the-Lake".